Ungarn und seine südlichen Nachbarländer seit 1526. 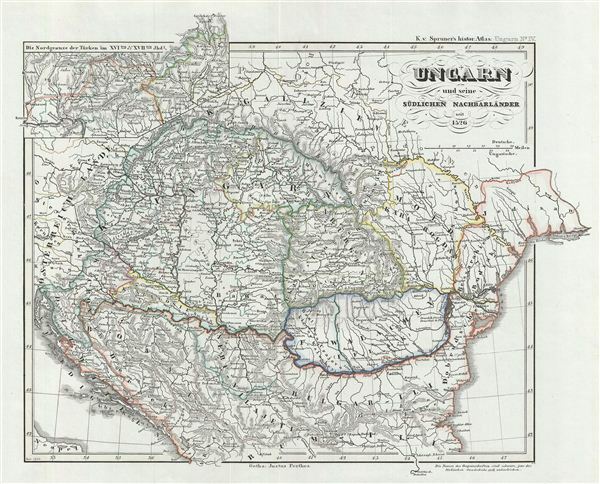 This is Karl von Spruner's 1854 map of Hungary and its neighbors since 1526. The map covers all of Hungary and includes an inset map detailing the northern boundary of Ottoman rule in the 16th and 17th century. The year 1526 marks the Battle of Mohacs where the Sultan Suleiman the Magnificent, leader of the Ottoman Turks, defeated King Louis II of Hungary and Bohemia. King Louis II died in the battle, ending Hungary's Jagiellon royal dynasty. The whole is rendered in finely engraved detail exhibiting throughout the fine craftsmanship of the Perthes firm. Prepared by Karl Spruner for publication as plate U IV in the second edition of Justus Perthes' 1854 Historich-Geographischer, Hand-Atlas zur Geschichte der Staaten europa's vom Anfang des Mittelalters bis auf die Neueste Zeit.